To be world champions on and off the court, delivering legendary moments every step of the way. We are committed to investing in our community and strive to make our residents proud, knowing we represent them in all we do. We invest our time, talent and resources to positively impact the lives of our fans and our community. We help children, especially those most at risk, reach their full potential by investing in their future. We are dedicated to creating an inclusive environment in which our fans, community and employees feel welcome, valued and appreciated. We promote a culture of creative thinking and informed risk taking. We continuously challenge ourselves and ask “why” and what we can do to be the best. We drive change through collective creativity and foster an environment where employees are encouraged to take risks in an effort to achieve breakthrough results. We develop innovative ideas to achieve added value for our colleagues, partners, fans and the community. We are committed to providing world-class service and entertainment to our customers by creating legendary moments. We hire and develop the best talent; employees that are passionate about delivering excellence. Teamwork is a key driver to our success on and off the court. We support teamwork through a culture of trust, respect and camaraderie. We practice selflessness on a daily basis and acknowledge that we are on the same team working towards one goal. We value multiple perspectives and diverse expertise. 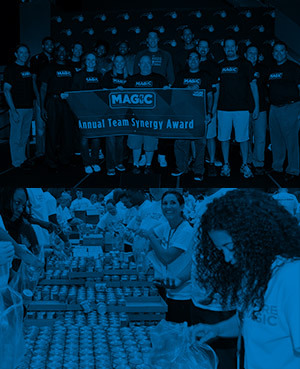 We foster a collaborative environment that allows for creativity in approach, ideas and suggestions for the greater good of the Orlando Magic. We are resilient and adhere to the values and vision of the organization, remaining positive through adversity while continuing to support one another.